If you're setting off on the journey of a lifetime, indulging in some gap year travel, hiking, camping and backpacking around Europe or further afield, you need to be well prepared! You'll need to organise passports and visas for every country you plan to visit, well in advance of your trip. Tourist visas are usually easy to get hold of, but if you intend to stay longer or work in any country, make sure you have the right documentation or you could find yourself in trouble. Many countries will ask you to produce your passport as a form of ID, so if your travels take you outside the EU, make sure that you carry your passport with you at all times and keep it safe! Anyone who intends to travel around the world, backpacking or otherwise, needs to make absolutely sure that they have the right insurance for their needs. Make sure that you're properly covered for the duration of your trip, and before you go, check your policy in detail to make sure that it covers everything you need it to. Take a copy of the policy documents with you, and keep hold of the help line number to contact in the UK if you need assistance - you never know when you might need it! It goes without saying that whether you're camping in France or backpacking around India, you should research the respect local laws, religions and customs. Take travel guides and read them before you arrive, or do some research on the Internet - but forewarned is most definitely forearmed, as you don't want to fall foul of local laws as soon as you set foot in a new country! Women should pack something to cover their heads, as some countries frown on uncovered heads - especially in religious buildings. Definitely take a first aid kit, and if you're travelling to any less developed countries consider taking syringes to avoid contracting diseases from contaminated needles if you need treatment. A good sleeping bag that can be rolled up is ideal. Most hostels charge for bedclothes -and you never quite know how clean they are! A cap, hat or bandana, to keep the sun off your head in hot countries, the rain off in wet countries, and your hair out of your out of your face. Water bottles - these will be essential in hot countries and if you are hiking a lot. Remember that the water may not be drinkable, so you'll need to keep these filled up with bottled water where possible- or take some water purifying tablets. A Swiss army knife, because you just never know when you'll need it! Don't take it in your hand luggage though, for obvious reasons! 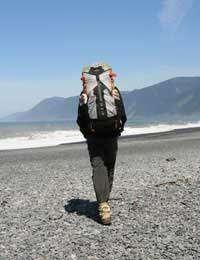 There are a wealth of websites and books designed to help people with backpacking and world travel, and before you think about setting off and satisfying your wanderlust, it pays to make sure you've done your reading, got all your documents in order and packed absolutely everything you can't get while you're away!